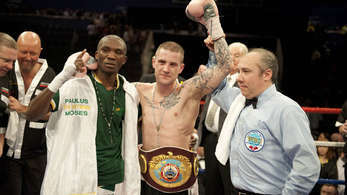 Ricky Burns made a successful first defence of his WBO lightweight title against Paulus Moses at the Braehead Arena. The 28-year-old from Coatbridge found it difficult for most of the fight to pin down the slippery Namibian, making for an absorbing rather than exciting battle. The unanimous scorecard of 119-110 120-110 117-111 probably did not reflect the difficulty Burns had against the 33-year-old former WBA lightweight champion. Promoter Frank Warren has tipped Burns to become a legend in the mould of Ken Buchanan but on this evidence he has still a bit to go. However, the Scot is likely to take another step towards that status with a mouthwatering all-British fight with Londoner Kevin Mitchell in the summer. The venue on the outskirts of Glasgow was packed to its 6,000 capacity and the crowd raised the roof when the champion entered the ring, following the traditional booing of the challenger. The wiry Moses, who came into the fight with an impressive 28-1-0 record having knocked out 19 of his opponents, took to the centre of the ring from the first bell but the Scot unleashed a couple of decent combinations to get the fans cheering. Burns started the second round in more positive mode but it was his good defensive work which was needed to dampen down the enthusiasm of Moses, who was clearly not in Scotland simply for the pay-day. The champion got the crowd going again in the third with some impressive combinations which rattled the Namibian - body shots and left hooks, in particular, doing the damage. Moses kept coming forward but was coming off second best in the exchanges and clinches. The African found his way through in the less intense fifth round with a good left hook which elicited an immediate response from Burns, who took a breather in the next, returning to the ropes to fend off his energetic opponent, although not always with success. It was warming up nicely as Moses piled forward swinging lefts and rights with enough success to silence the crowd at times as the champion looked increasingly at unease. The eighth was another triumph for defences, a scrappy melee with too much holding and neither fighter getting clean punches on target although the champion perhaps again had the edge. Moses did find the chin with a solid right hand in the next round which Burns shrugged off but it was turning into a uncomfortable night for the Coatbridge man. At the start of the 10th round Burns had to withstand an opening flurry from the prowling Namibian who was right back in the fight which was being fought through differing levels of tiredness and desperation. Both fighters hugged before the start of the final round with the champion staying out of enough trouble and impressing the judges with some well-targeted punches to ensure he retained his belt.